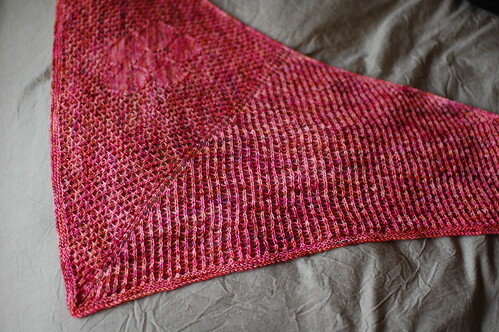 The shawl I started in Hawaii out of Koigu is off the needles and blocked – the pattern’s even in pretty good shape too. It’ll be ready soon. It didn’t use 2 skeins of Koigu as I’d hoped, but I’m happy with the size using 3 skeins – it’s closer to a full size shawl, 23 inches deep and 63 inches across the top. And it has a summery surprise in the stitch pattern! It still needs a name though. And since that shawl’s finally off the needles, I’m back on board with my Honeybee lace cardigan. It’s almost done, just the collar to go. Then I have to find some buttons, hmmm. I love how the honeybee is turning out. It’s definitely on my short list of cardis to make (once the pattern is out). 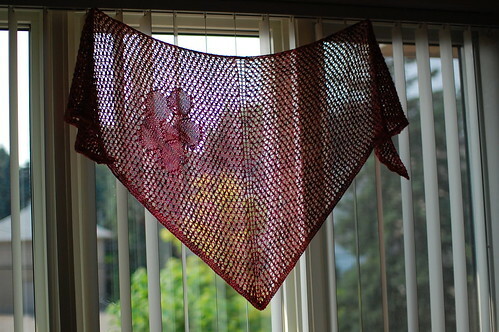 How about “Hibiscus” for the shawl? How about Rose of Sharon? Or Hanalei? OH MY! That shawl is so awesome! Can’t wait for the pattern! For the shawl, an other idea, to increase your choice : “flying flower”. Love the shawl! And I second the name hibiscus for it. 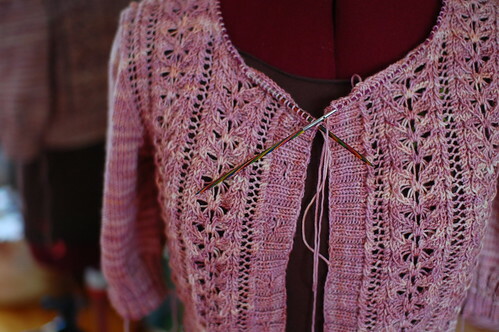 ooh, i’m excited for the honerybee lace cardigan!! the shawl looks great, too. Great shawl! Are you going to sell that pattern too? How lovely — I love the flower on it, the rest is simple. I was also going to vote for hibiscus too! Lovely shawl. How about Hanalei Bloom (a play on the song Hanalei Moon) if you can’t decide between the plumeria (which is what it looks more like) and hibiscus names? 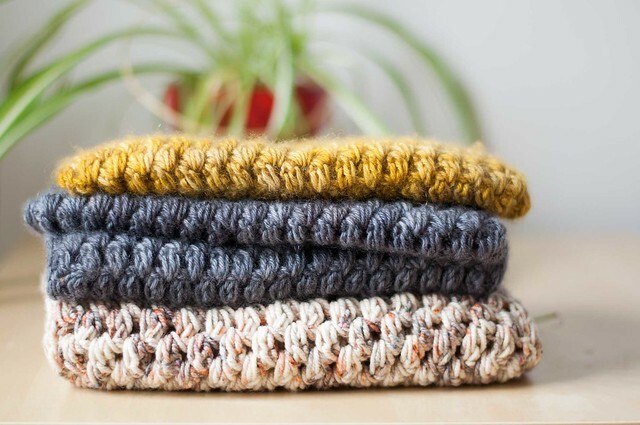 Wow… I don’t consider myself a shawl knitter, but that shawl is just simply elegant! I look forward to the pattern! Lovely! I’m thinking ‘hibiscus’ would be a good name. The shawl is very innovative; I love it! Ooh! I love the … is that a hyacinth? … the flower in the otherwise plain lace of the shawl. What a great idea! Sign me up. Oh wow that cardigan is amazing! Are you writing up the pattern, or is it someone elses? Love the shawl and the sweater–both so gorgeous!!! One thing I remember from my trip to Kauai and Oahu, was the Plumeria flowers or Frangipani. Your shawl and its flower reminds me of those flowers. I can still smell them! And I love the Honeybee lace cardigan!